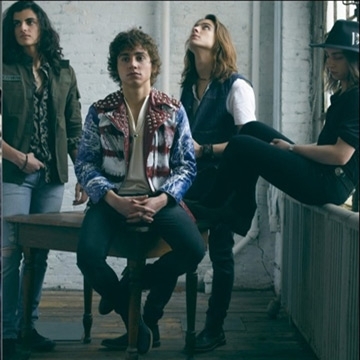 Music fans were first introduced to Greta Van Fleet Josh Kiszka/vocals, Jake Kiszka/guitars, Sam Kiszka/bass & keys, and Danny Wagner/drums - in March 2017 with the release of the band's debut single "Highway Tune" that held the #1 position on U.S. Rock Radio Charts for five consecutive weeks and on Canada's Active Rock Radio Charts for nine straight weeks. Greta Van Fleet will see its debut album, Anthem of the Peaceful Army, released on October 19, 2018 (Lava/Republic Records). The album’s first radio track, “When The Curtain Falls,” took a mere three weeks to explode into the Top 10 at Rock Radio and is currently at #3 on the Rock Radio charts. The song has accumulated more than 18.5-million streams, and four million-plus views of the track’s companion music video. Greta Van Fleet’s shared message with their music is to spread “peace, love and unity,” and their collective goal is to have people walk out of their live shows feeling invigorated, energised and exhilarated, and to take that feeling out into the world.